We offer a wide variety of Kids Socks. These include Plain Socks, Cartoon Characters, Stripes Designs, Anklets available in Cotton and Woolen. All are manufactured using finest Cotton and Wool Yarns. Being a customer focused organization, we are engaged in manufacturing, supplying and wholesaling Kids Terry Socks. Our product-line is widely acknowledged in the market as it is knitted using excellent quality fabric. Customers can avail these socks from us in various colors and designs as per their choices. We hold expertise in manufacturing, supplying and wholesaling high quality Kids Woolen Socks. These socks are designed making use of optimum quality fabric under the supervision of creative designers. Prior to dispatch, the offered socks are strictly tested on various parameters. All our products are made using finest woolen yarns for a cozy fit. Our organization is counted amongst the most distinguished manufacturers, suppliers and wholesalers of excellent quality Kids Cotton Socks. The offered range of socks is knitted by making use of optimum quality cotton by our qualified professionals. 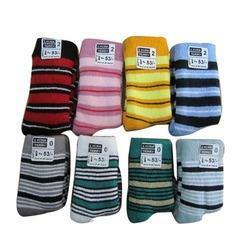 All these socks are offered by us in various colors, sizes and designs at industry-leading rates.